Manager John Ingle wants a title shot for Jordan ‘The Thrill’ Gill next after seeing him extend his unbeaten record to 16 fights in Sheffield. The Chatteris featherweight came through a good six-round test against Plymouth’s Chris Adaway on Saturday night. Gill pulled away in the last couple of rounds for a 58-55 points win on referee Howard Foster’s scorecard after Adaway had rallied from a second-round knockdown. That performance has convinced Ingle the 21 year-old is ready to challenge for Southern Area or English honours. 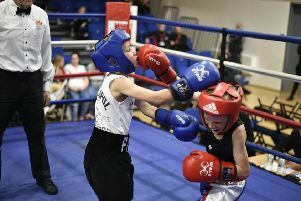 Devon’s Jamie Speight holds the Southern Area title, while the St George’s belt is vacant after Isaac Lowe stepped up to win Commonwealth honours. Ingle said: “There’s no rush with Jordan, but I’m thinking of putting him forward for the Southern Area or English title. “He didn’t really show what he can do against Adaway, but he’s been doing very well sparring (British bantamweight champion) Ryan Burnett. Gill said he was ‘very disappointed’ with the way he boxed at the Sheffield Arena - despite chalking up the best win of his three-year professional career. Adaway is the sort of opponent who tests young fighters on the way up and for a couple of rounds, Gill dazzled against him. He was quicker to the punch and when Adaway did lead off, Gill made him miss and countered with clusters of fast punches to body and head. In the second round, Gill was only a clean punch or two away from handing the 22 year-old window cleaner the first stoppage loss of his career. Gill punched him to the floor with a flurry and though Adaway got to his feet smiling, his nose was bleeding and he was hurt. He felt body punches as Gill went for the finish - and was relieved to hear the bell at the end of the round after a spell under fire on the ropes. The third and fourth rounds were more competitive. As he admitted afterwards, Gill neglected his boxing as he went looking for the knock-out punch and that allowed Adaway back into the fight. He tightened his defences and landed enough jabs and left hooks to close the gap on the referee’s scorecard. There was some concern from trainer Dominic Ingle in Gill’s corner at the end of the fourth - and he responded. Gill ditched his plans to go for the knockout and got back on his toes in the last two rounds to make sure of victory. Gill said in his changing room afterwards: “I wanted to put on a show, but I didn’t really do that. “For me, it was a bad day at the office. I felt a bit lacklustre and flat-footed in there. “I probably would have boxed better if I hadn’t knocked him down in the second round. “I loaded up too much after that. I went looking for the knockout when I should have stuck to my boxing. Ingle revealed Gill had spent a week out of the gym after picking up a cold and assessing his performance, he said: “Jordan looked good in spells - and he looked ordinary in spells as well. “Adaway has never been stopped before and if Jordan had gone to the body a bit more in the early rounds, he might have got him out of there. “Jordan is his own harshest critic and he didn’t really show what he can do in there.